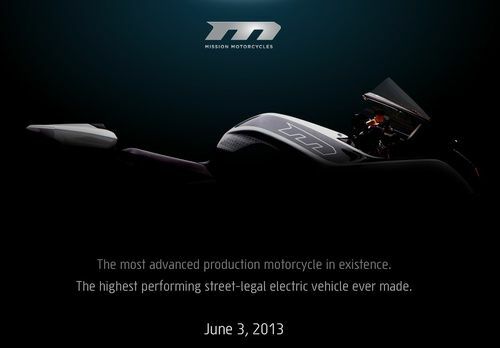 Coming June 3, Mission Motors promises to unveil the most advanced production motorcycle, that will also be the highest performance electric vehicle in existence. A few years ago Mission Motors wow'd us with an electric motorcycle they positioned as the Tesla Roadster of motorcycles. The Mission One was able to race in the 2009 TTXGP on the Isle of Man, and later set a land speed record for electric motorcycles. But the company later made a course change, steering away from making electric motorcycles and towards making electric vehicle components to sell to OEM's. On Wednesday, the Mission Motors team tweeted out a link to a stealth start-up style website showing that the company is planning to reenter the electric motorcycle business. There are no details to be had. Instead the website just says there will a revelation on June 3, and shows the shadowy outline of a motorcycle. What's shown is more than reminiscent of the Mission R outline. That's good because the Mission One had a downright strange look, while the Mission R looked much more like other race-inspired street bikes. The company treated the Mission R as a test-bed, and kept insisting they were not in the business of selling motorcycles. Instead, the motorcycle served as an excellent platform for validating high performance, ultra compact, low weight components. By the time the Mission R was unveiled in 2011 they had already transitioned into the role of electric drive train components supplier. With that bike, they won the 2011 TTXGP/e-Power race at Laguna Seca handily beating Lightning Motorcycles and MotoCzysz so badly that the lap speed record set by Steve Rapp still stands today. With that kind of record behind them, one can only guess at the performance level Mission will be able to deliver in 2013. What their website promises is the most advanced production motorcycle ever, and the highest performing street-legal electric vehicle ever made. The primary contender for this claim would be the aforementioned Lightning Motorcycles. They are already in limited production of their street legal electric motorcycle, offering a performance level identical to what they've raced with the last couple years. Mission beat Lightning (and MotoCzysz) two years ago, and Lightning did not break Mission's lap record during the 2012 TTXGP/e-Power. This makes it plausible that the 2013 Mission could beat the 2013 Lightning, but we won't be able to verify this unless Mission and Lightning (and Brammo and MotoCzysz) end up in a race together. Such as the eRoadRacing series event (the replacement for the TTXGP and e-Power series) at Laguna Seca in late July 2013.